Company business strategy explains how a firm differentiates itself from competitors, how it generates revenues, and where it earns margins. In competitive industries, each firm formulates a strategy it believes it can exploit. Textbooks sometimes define business strategy simply as a firm's high-level plan for reaching specific business objectives. Strategic plans succeed when they lead to business growth, a strong competitive position, and strong financial performance. When the high-level strategy fails, however, the firm must either change its approach or prepare to go out of business. The choice of objectives is the heart of the strategy, but a complete approach also describes concretely how the firm plans to meet these objectives. As a result, the strategy explains in practical terms how the firm differentiates itself from competitors, how it earns revenues, and where it earns margins. Strategies Reflect the Firm's Strengths, Vulnerabilities, Resources, and Opportunities. And, They also Reflect the Firm's Competitors and Its Market. Many different strategies and business models are possible, even for companies in the same industry selling similar products or services. Southwest Airlines (in the US) and Ryan Air (in Europe), for instance, have strategies based on providing low-cost transportation. The approach for Singapore Airlines focuses instead on brand image for luxury and quality service. In competitive industries, each firm formulates a strategy it believes it can exploit. In business, the strategy begins with a focus on the highest level objective in private industry: Increasing owner value. For most companies that is the firm's reason for being. In practical terms, however, firms achieve this objective only by earning profits. For most firms, therefore, the highest goal can be stated by referring to "profits." The generic business strategy, therefore, aims first to earn, sustain, and grow profits. Strategy discussions are sometimes confusing because most firms have many strategies, not just a single "business strategy." Analysts sometimes say marketing strategy when they mean the firm's competitive strategy. And, a firm's financial strategy is something different from its pricing strategy, or operational strategy. The firm's many strategic plans interact, but they have different objectives and different action plans. The subject business strategy is easier to understand—to make coherent—by viewing each one as part of a strategic framework. The strategic framework is a hierarchy. At the top sits the firm's overall (or generic) business strategy. Here, the aim is the highest-level business objective: earn, sustain, and grow profits. Some may immediately ask: Exactly how does the firm achieve it's profit objectives? Firms in competitive industries answer the "how" question by explaining how the firm competes. For these firms, therefore, the overall business strategy is rightly called a competitive strategy. A "competitive strategy" explains in general terms how the firm differentiates itself from the competition, defines its market, and creates customer demand. However, detailed and concrete answers to the "how" question lie in lower level strategies, such as the marketing strategy, operational strategy, or financial strategy, The marketing strategy, for instance, might aim to "Achieve leading market share." Or, "Establish leading brand awareness." Financial strategy objectives might include: "Maintain sufficient working capital" or "Create a high-leverage capital structure." Specific business objectives for each strategy. Identifying which goals in the framework have priority over others. Mapping relationships between the various strategies. Showing, for example, which of them support others. This article, therefore, presents business strategies as components of a strategic framework. Presents and compares working definitions for business strategy, generic strategy, competitive strategy, top-level strategy, and strategic objective. Explains why firms sometimes change strategies and how to measure change impact with selective income metrics such as EBIT and EBITDA. Shows how to formulate the top-level competitive strategy in five steps, starting with the founder's vision and building into a complete strategic framework. Illustrates the quantitative business model role in validating a strategy proposal. Strategy and the meaning of success. How do firms know when to change strategies? How do they know if the new plan succeeds? How do you formulate a business strategy? Formulating a general business strategy in five steps. Firstly, build on the vision. Secondly, focus on the most critical objectives. Thirdly, plan the attack, choose the battlefield. Fourthly, take a reality check: Does the business model stand? Fifthly, build a support structure: The strategic framework. Brand, the branding process, and branding strategies: See Branding. Pricing, pricing objectives, and pricing strategies: See Pricing. Company profitability metrics. See Profitability. Capital and financial structures. See Capital Structure, Financial Structure, and Leverage. How Do You Know the Strategy Serves its Purpose? Business strategies succeed when they lead to business growth, strong competitive position, and strong financial performance. Many different approaches are possible, but all are meant to bring improvements in these areas. In highly competitive industries, the firm's officers and other senior managers take a keen interest in knowing precisely how well their strategies succeed in serving this purpose. Interest is especially keen immediately after the company changes or adjusts plans. Dominos Pizza Changes Strategies. Was the New Strategy Successful? In 2009, for instance, managers and owners of Domino's Pizza, Inc. were distressed because the firm had just had three years of negative sales growth and shrinking market share. The firm was, in particular, losing market share to two significant competitors, Papa John's and Pizza Hut. Domino's operates in the "Quick Service Restaurant" (QSR) industry. Many people call this industry, unkindly, the "Fast Food" business. The firm competes not only with other Pizza restaurants, but also with restaurants with different menus such as Subway, McDonald's, and Chick-Fil-A. This segment of the Restaurant industry defines itself not by menus, but instead by the words "Fast" and "Quick." Understandably, therefore, Domino's started with a strategy based on "Quick Service Delivery." The firm excels in fast delivery, a point that separates Domino's from its competitors. Nevertheless, in 2009, the strategy seemed to be failing. In late 2009, therefore, the firm's new CEO chose to "re-center" strategy on pizza quality. Market research showed that customers rated Domino's pizza taste as very poor ("like cardboard"). As a result, by the end of 2009, the firm had substantially improved the pizza recipe and launched a marketing program to bring this news to the market. The question on January 1, 2010, was: Will the new strategy work? The Results Are "In." Strategy Change Succedes. Anxious for an answer, the firm began in Q4 2009 detailed tracking of the growth, competitive, and financial metrics that appear in the next section. By the end of Q1 2010, the first results were "in." The measures in all three categories showed remarkable improvement. Domino's took this as confirmation the new strategy was succeeding. Now in 2018, the firm continues to research and improve the pizza recipe, while adjusting its marketing strategy at the same time. For this, the firm relies on its 8-year tracking history with these metrics. Notice that analysts measure the impact on financial performance with metrics that focus on the firm's core line of business. Domino's, for instance, prefers to measure strategic impact with EBITDA—Earnings before interest, taxes, depreciation, and amortization. Domino's tracks EBITDA because EBITDA and other selective income metrics measure strategic effects more precisely than overall Net Income After Taxes. The firm's strategy drives performance in the core line of business, after all, and that is what strategic planners need to measure. "Bottom line" Net income, however, also reflects factors other than core strategy: (1) revenues and expenses from outside the core business, (2) accounting conventions such as depreciation, and (3) taxes. These factors tend to "muddy the waters" when the analyst tries to use Net Income to measure the impact of strategy changes. How Do You Formulate a Strategy? Exhibit 1. Formulating a generic competitive strategy in five steps. This strategy building process is rational, straightforward, and likely to succeed—if the strategy builder takes these steps in order. Note that businesspeople rightly speak of strategy building as strategy formulation, instead of "writing a strategy." The verb formulate suggests a building process that is orderly or systematic and results that are definitive and precise. Successful strategies build on the founder's vision for the business. For some firms, the founders write a formal vision statement. Others list the core ideas that give the business substance, shape, and direction.Either way, the vision pictures the essential nature of the business: what it looks like and what it does. Strategy formulation Step 1 lays a foundation for the strategy. Here, the strategy builder re-states several ideas from the founder's vision for the business. The business strategy builds directly on the firm's offerings and its value proposition. This proposition describes the goods and services the firm sells, regarding the value they offer to the customer. For instance, Dell began in 1984 with a value proposition that was unique at the time. Dell promised to build a computer when a customer orders, exactly as the customer wants it, and deliver it at a very competitive price. For example, Boeing states the customer value proposition for its 747-8 aircraft very briefly: "...more range, better fuel efficiency, and lower operating costs." In brief, the value proposition explains why customers would buy from this firm instead of the competition. In this way, the value proposition shows how the firm creates customer demand and differentiates itself from competitors. Naming the firm's industry sector help's identify the firm's competitors. And from that, the strategy builder learns which strategies the firm must compete against in the marketplace. The strategy builder's task is to understand which approaches work well in the industry and which do not. Firstly, deliver orders very quickly after ordering. Thirdly, provide a "family friendly" setting. When Domino's changed strategies in 2009, it did so after reviewing the approaches of its competitors, Papa John's, Pizza Hut, Subway, Chick-Fil-A, McDonald's, and others. Note that a single firm can operate in several industries. Apple, for instance, operates in at least five industry sectors: Computer hardware, Computer software, Consumer electronics, Digital distribution, and Silicon Design. Apple faces a different set of competitors in each of these industries. There are, incidentally, quite a few industry classification schemes, or taxonomies, in use, worldwide. However, for strategy builders, all that matters is that the firm refers to a system that identifies the firm's competitors accurately. Identify first the firm's customers as either consumers or businesses. This distinction is essential for strategy builders because consumers and business firms buy for different reasons. They have different criteria for deciding what and when to purchase. And, they respond differently to seller pricing strategies. Identify also the target market for the firm's offerings and value proposition. Note that markets can have quite a few defining characteristics. When customers are consumers, marketers define the market with factors such as gender, age, occupation, economic status, work experience, education, geographic location, or special interests. If, however, the firm sells to other businesses ("business-to-business," or B2B), it may define its market by factors such as customer industry, customer business model, or manner of selling. Businesspeople sometimes ask: What is the purpose of the strategy? The answer has to name a business objective. The strategy's reason for being is to explain how the firm achieves specific goals. Strategy formulation continues in Step 2 by naming tangible top-level of business objectives and explaining how to measure progress towards meeting them. The generic business strategy explicitly addresses the firm's most important goals. As a result, Strategy formulation Step 2 is a matter of specifying the firm's highest level objectives. Firstly by distributing some or all profits directly to shareholder owners as dividends. Secondly, by keeping some or all profits as retained earnings, thereby building owners equity on the Balance Sheet. Most government and non-profit organizations, of course, do not exist to meet profit objectives. A few—such as Postal Services, licensing agencies, or lottery commissions—do generate revenues and try to earn enough to cover their expenses. However, for these and all other government and non-profit firms, critical strategic objectives derive from mission statements. ODOT Mission: To provide a safe, efficient transportation system that supports economic opportunity and livable communities for Oregonians. From this, ODOT derives five critical strategic objectives: (1) Safety, (2) Mobility, (3) Preservation, (4) Sustainability, and (5) Stewardship. ODOT further explains the meaning of each objective in concrete terms. And, it provides tangible performance measures for each goal, which are useful for developing the Department's strategy. In this way, performance measures also help set targets, plan budgets, and evaluate Department performance. Mission Statements and Values in Private Industry. Some businesspeople are not pleased when they think they have just heard that their firm's "only" objective is "earning profits." They are displeased because many firms have mission statements, value statements, and creeds that point to still higher objectives. People understandably ask whether strategy builders should place these objectives on the same high-level as the profit objective. Example: high-level Values at Johnson & Johnson. "Our first responsibility is to the doctors, nurses, and patients, to mothers and fathers and all others who use our products and services." "Secondly, we are responsible to our employees, the men, and the women who work with us throughout the world. Thirdly, we are responsible to the communities in which we live and work and to the world community as well. Our final responsibility is to our stockholders. The firm takes these responsibilities seriously. J&J displays the credo prominently in corporate buildings and on corporate grounds. And they emphasize these values in communications and reports. J&J describes them as "values that guide our decision-making." As a result, the firm tracks its success in meeting these responsibilities with surveys and performance indicators. Are Important Values Strategic Objectives? Firstly, a plan of attack, which is the general approach for differentiating the firm and its offerings from the competition. Secondly, the battlefield, which is the specific market and market focus where competition takes place. Strategy formulation Step 3 addresses the "How" question: Exactly how does the company achieve objectives? For firms in competitive industries, the question becomes this: Specifically, how does the company win against competitors, create customer demand, and earn, sustain, and grow profits? For these firms, the generic business strategy is a competitive strategy. For many decades, textbooks and business articles have put forward the idea that strategic planners have essentially only two possible plans of attack: Firstly, differentiation and secondly, cost leadership. Achieving brand strength, communicating desirability, exclusiveness, superior design, or high quality. Pricing to undersell the competition. Firms that pursue cost leadership goals minimize their production and selling costs. Companies with a "cost leadership" strategy can charge industry average prices and still earn handsome profits because their costs are lower than the competition. However, firms using cost leadership may also add an element of differentiation by selling at lower prices. Even so, they can still realize acceptable margins because their costs are low. Discussions on business strategy usually refer to several ideas of Michael Porter. These stem primarily from Porter's books, Competitive Strategy1 (1980) and Competitive Advantage2 (1985). Porter's approach adds a second choice for strategy builders: the scope of the attack against competitors. Porter's system allows strategy builders to select between attack plans "Differentiation" and "Cost leadership," but also to choose the level of market scope for competitive activities. The strategy may target a broad market, or it may target a narrowly focused market. As a result, under Porter's system, the strategy builder chooses from four generic competitive strategies. Exhibit 1 shows the possibilities. In competitive industries, each firm chooses the strategy it believes it is best prepared to exploit. Making that judgment, however, calls for excellent and detailed knowledge in several different areas. Firstly, the Strategy Builder Considers the Firm's Strengths, Vulnerabilities, Resources, and Opportunities. Strategy builders, in other words, need access to information about their firm—some of which is public, and some of which is probably proprietary, or "inside" information. Areas of strength might include, for instance, the firm's capabilities in design, research, development, service delivery, or efficient production. Other advantages might involve an existing market presence, strong branding, or effective sales and marketing. Vulnerabilities might include specific weaknesses, inabilities, or ongoing problems. The firm might be struggling with cash flow problems and a shortage of working capital. Or, it may operate with a high-leverage capital structure—making it vulnerable to business slowdowns or other changes in the economy. Or, the firm may be unable to bring new products to market quickly. Resources might include, for example, existing production capacity and the infrastructure to support it, or existing service delivery capabilities. Resources might also include access to capital, or sufficient working capital for product research and development, marketing programs, or infrastructure upgrades. The firm might see opportunities in the form of a failing competitor, or an expanding market, or an idea for an entirely new product. Secondly, the Strategy Builder Tries to Understand the Firm's Competitors and Their Strategies. The strategy builder identified the firm's industry in Step 1 (Build on the vision). Naming the industry sector helps identify the firm's competitors. Understanding the competition begins by identifying which competitors hold a significant share in the firm's target markets. It is essential to know which of these are gaining market share, losing market share, or merely holding market share. From this, the strategy builder finds which strategies are working in this market, and which are not. Incidentally, firms cannot hide their generic strategies from competitors. One firm can reasonably deduce the strategic plan of another from knowledge of the competitor's product history, pricing history, and marketing messages. Thirdly, the Strategy Builder Tries to Understand the Dynamics of the Firm's Target Market and Its Customer Base. In Step 1 (Build on the vision), the strategy builder also states the firm's offerings, its value proposition, its target customers, and its target market. The strategy builder will try to understand first the buying behavior of the firm's customers by understanding what defines "value" for these customers: They may shop for price, for the brand, or they may judge "value" by other criteria. Understanding the dynamics of the target market will also be necessary for Step 5 (Reality check: Does the business model stand?). For this, the strategy builder needs to know, especially, market size and market growth rate. Knowledge in the above areas may be considered the necessary "background" for choosing and building a strategic plan. From this, strategy builders sense intuitively which general strategy will serve the firm best. And they may at this point have some sense of how the firm will differentiate itself and create customer demand. This much, however, is not yet a strategy. Reality Check: Does the Model Stand? The strategy will be ready to "go to market" only after it validates with a quantitative business model. Strategy formulation Step 4 completes the general business strategy by developing the business model inherent in the strategic plan. Here, the challenge is to build a quantitative model, implied by the approach, that is realistic and credible. The Model Serves As a "Reality Check" For the Generic Strategy. For this, the strategy builder uses the background knowledge from Step 3 along with realistic sales and cost assumptions to build a quantitative business model. The resulting model shows whether or not a proposed strategy can bring desirable sales revenues, margins, and profits. When the firm chooses to implement the strategy, the model becomes the cornerstone of the firm's business plan. In that capacity, the model also supports the forecasting of sales revenues, costs, margins, and profits. In its purest form, the business model looks like a very brief version of the firm's Income statement. Like the Income statement, the model starts with sales revenues. Estimated expenses are subtracted from these to create margins and profits—gross profit, gross margin, operating profit before taxes, and operating profits and margin after taxes. Exhibit 2 shows two models, from two different firms, each with its generic strategy. Figures are in $1,000s. Exhibit 2. Business models for firms Alpha and Beta. Each firm develops its model from its generic strategy proposal. The models rely on sales and cost assumptions they believe are reasonable. Firstly, target product revenues and target services revenues. Cost of Goods sold and Cost of services. Administrative and general overhead expenses. Market size and current sales of similar products and services in this market. The proposed strategy will either focus on a narrow market or a broad market. The firm's likely market share and competitors' market share. The firm's ability to differentiate itself from the competition under the possible strategy. Also, the firm's ability to benefit from strong branding under the strategic plan. The firm will differentiate either by unique product attributes, branding or through low-cost pricing. Target revenues and the firm's current Cost of goods sold or Cost of services. The firm's current cost structure. Cost structure changes under the proposed strategy. Strong branding emphasizing product quality, "cutting-edge" design, and desirability. Branding efforts will communicate product qualities central to the firm's value proposition. Unique product features and capabilities. For these, Alpha intends to achieve market penetration and market leadership by being "first to market." With successful branding, moreover, Alpha believes it can charge premium prices and still sell successfully in a vast market. Firm beta has chosen to propose a cost leadership strategy, targeting a broad market. For this, Beta will differentiate itself from competitors by selling at prices below industry averages. Success with the strategic plan depends on keeping expenses low. Should either firm choose its proposal strategy? The answer depends on these considerations. Conservative revenue estimates—realistic, but lower than the firm's most likely revenue estimates. Pessimistic expense estimates—realistic, but somewhat higher than the firm's most likely cost estimates. Secondly, the acceptability of the forecast profits and net profit margin. Are these profits and margins sustainable? Do they point to continued growth? Do these profits support the firm's targets for retained earnings growth? For dividend payments? How do these profits impact profitability metrics and valuation metrics, such as earnings per share (EPS) and return on assets (ROA)? Firms succeed partly because their high-level generic strategies are successful. Generic plans need support, however, from quite a few lower level strategies. 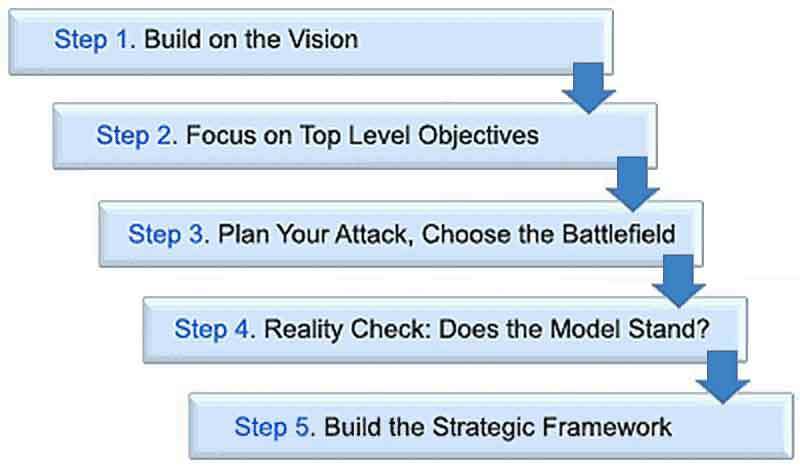 Strategy formulation Step 5 completes the strategic framework that supports the general strategic plan. Success with the highest-level strategy is due to the underlying product strategy, branding strategy, and operational strategy, for instance, to name just a few. "Apple’s general approach is broad differentiation. This generic strategy focuses on key features that differentiate the firm and its products from competitors. Through the broad differentiation generic strategy, Apple stands out in the market. For example, emphasis on elegant design combined with user-friendliness and high-end branding effectively differentiate the firm. The broad differentiation generic strategy means that Apple always aims to set itself apart from competitors not by price but by other vital features beneficial to customers." Note that explaining exactly how Apple differentiates itself calls for a description of Apple's product strategy and its branding strategy. Success with these strategies, however, depends on the presence of successful plans for pricing, selling, operations, product production, product distribution, and customer satisfaction. Generic strategies succeed, in other words, because they sit at the top of a complete strategic framework. The framework components are lower-level strategies, their objectives, and their action plans. Note that individual strategic plans impact each other for this reason: the goals for each strategy support also objectives for different strategies. Building the Framework: Focus on the Objectives. Exhibit 3 shows the top two levels in one firm's strategic framework. Exhibit 3. The first three lower-level strategies immediately under the higher-level general strategic plan are, for many companies, (1) The marketing strategy, (2) the operational strategy, and (3) the strategic financial plan. The second-tier strategies cover the inventory of objectives that must be met, to make the quantitative business model "work." These objectives were assumptions for the model builder. For the strategy builder, they now become targets to achieve with lower level strategies. In its Exhibit 2 business model, for instance, Company Alpha forecast product revenues of $100,000,000. To achieve $100 million in product revenues, however, the model builder had to make quite a few assumptions. Demand as a function of pricing. Calculations using these numbers lead to the forecast first-year sales revenues of $100,000,000. As a result, Alpha's marketing strategy must plan and achieve the assumed target values, by making each assumption an objective for the marketing strategy. It is clear at this point that reaching marketing strategy objectives, calls for another tier of lower level strategies. Alpha will pursue the strategic marketing objectives through its product strategy, branding strategy, and advertising strategy, for instance. To estimate revenue and expense figure estimates for the model, Alpha also had to make quantitative assumptions about many of the factors in Exhibit 3 under "Operational" and "Financial" strategies. When is it Time to Change Strategies? For firms that know where to look, strategies do give early warning when failure is underway. The challenge is knowing what to change and how to change it. In most cases, the road back to a successful strategy begins with adjustments to existing lower level strategies—not a rejection of the entire top-level generic competitive plan. For example, the Canadian firm Research In Motion dominated the mobile smartphone market for much of the first decade of the 21st century with its Blackberry devices. RIM's successful strategy included unique product features, excellent messaging performance, and security. Another focus of RIM's strategy was its "Enterprise model." For this, the firm focused more on selling to corporate buyers and less on marketing to end-user consumers. Most businesspeople know well how quickly RIM's market share fell after Apple introduced the iPhone in 2007. The fall continued as still other competitors entered the smartphone market shortly afterward. For a few years, the RIM firm (now re-named Blackberry) struggled to recover success with its existing product strategy and the Enterprise model. Only much later did the firm fully embrace the idea of changing strategic places. As of 2017, the firm is still struggling to find a new generic competitive strategy that works. An example above describes the more successful strategic changes made at Domino's Pizzha in 2009. At that time, management and shareholders were worried because the firm had suffered three years of negative sales growth and shrinking market share. Domino's operates in the "Quick Service Restaurant" (QSR) industry—an industry segment defined not by restaurant menu, but instead by the words "Fast" and "Quick." For this reason, the firm's strategy in 2009 focused primarily on "Quick Service Delivery." However, even though the firm excels in fast delivery, the strategy was failing. At Domino's, it took the arrival of a new CEO to take action, quickly, and make strategic changes. The story of the resulting success appears above. What is crucial to emphasize was the nature of the change process. Domino's changed little about its generic competitive strategy. More accurately, Domino's merely adjusted its product strategy—refocusing marketing and branding emphasis to taste and quality of the menu. Both firms in the examples—Domino's and Blackberry—suffered several years of declining market share before taking action to change or adjust the strategy. From this experience, however, Domino's has learned the importance of paying close attention to the extensive set of performance metrics appearing above in the section Purpose of the Strategy. A few these will give early warning—before the others—that one or more specific components of the strategic framework are beginning to fail. At this point, before the entire business fails, the firm may be able to reverse decline through carefully monitored adjustments to these framework elements.